Misdirection in magic may be as simple as a magician rolling up his sleeves and saying “nothing up my sleeve” and then producing an object that could never have been “up his sleeve”… Attention can be controlled in various ways. A magician will first grab attention with a coin, or another small and shiny object… Then attention is directed away from the object (hence, “misdirection”) through a combination of comedy, sleight of hand or an unimportant object of focus, thus providing just enough time for the magician to do whatever he or she wishes to do with the original object. Okay, so this baby sweater isn’t shiny, but perhaps it will distract from the fact that the Lessa sweater grafting project is temporarily on hold until I get a chunk of quiet time to myself. Our second grandson is almost a year old, and doesn’t have a Nana-knitted sweater of his own yet! (Give me a break – I was recovering from the baby blanket last winter, and it has NOT been sweater weather for the last several months.) 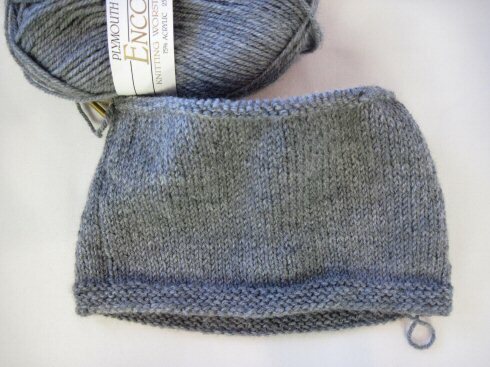 His mom requested a pullover in grey, and after doing a fair bit of looking around for a nice, washable heathery grey yarn, we decided on Plymouth Encore. Yeah, I know. It’s 75% acrylic. But I console myself with the fact that it’s 25% wool. I try not to be a yarn snob, but that tendency is a natural result of being a spinner. I would have preferred superwash wool, but since I couldn’t find one that suited, this is a good solution. The important thing is to make sure that this little sweater will be easy-care and wearable! So. I had the yarn and an idea of what my daughter wanted for him. She is a generous soul, and understands that I need it to be an interesting little project, so gives me leeway in the design. I’ve never made a gansey (or guernsey, if you prefer), so that seemed like a good place to start – but of course the usual pullover neckline won’t do at all for baby proportions, so this one will have a henley-style button front. I have a few good books to use as reference, and since I’m at the deciding point about what designs to put on the upper section, am enjoying sorting through my choices for a combination that will fit nicely into 51 stitches.